The exercises are in three categories according to difficulty, and there is a further group of exercises on living in the UK. Each language level offers exercises on verbs, other parts of speech and use of language, with sub-menus for each. The 'Living in the UK' section gives essential information for the newcomer. Grammatical concepts are explained in simple terms. Learners whose English is not sufficiently advanced to understand these, will benefit more from the example sentences. The learner can read and listen to a series of sentences illustrating the particular point. The sentences have been recorded by teachers from different parts of the UK, so that learners hear a variety of voices and accents. The exercises vary in type - gap-fill (with or without options), substitution (with or without options), re-ordering words, re-ordering sentences, correcting sentences (e.g. punctuation), questions about sentences (e.g. their meaning), selecting words from a sentence (e.g. Find the adjective) and matching two halves of a sentence or two parts of a word. At the end of an exercise the learner is given a score. The computer records the score achieved at first attempt, how many times an exercise is attempted and the best score. It also records whether the pupil has read the note and/or the sentences. This information can be printed out at the end of a session. The user’s performance is stored on the computer, so that an on-going record is kept of which exercises have been completed, the scores achieved, and which particular questions have caused problems. This allows the teacher to monitor a pupil’s progress, and also suggests which exercises should be attempted next. Using the Editor provided you can make up your own exercises. A variety of types of exercise is available: gap-fill, with or without multiple-choice answers; substitution, with or without multiple-choice answers; rearranging words in a sentence or sentences in a text; changing sentences by correction (e.g. punctuation) or re-writing; multiple-choice questions about sentences, e.g. their meaning; selecting a word or words, e.g. "Find the verb"; matching two words, two halves of a sentence, etc. 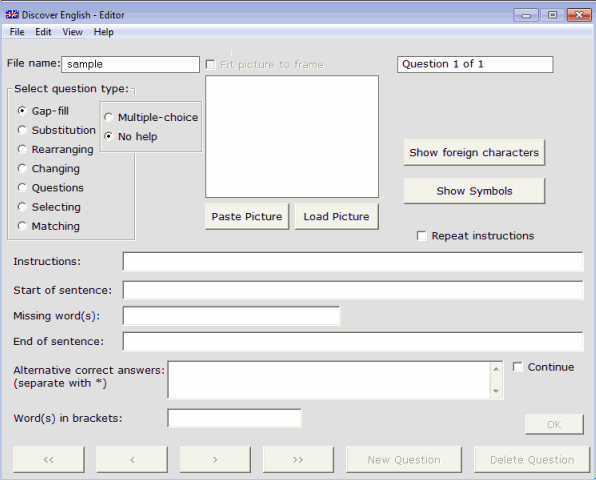 All exercises (including ones you have made up yourself) can be printed from the Editor interface as paper worksheets. Answer sheets can also be printed.